I really can't say enough good things about our favorite salt substitute, Bragg Liquid Aminos. Bragg Liquid Aminos was developed by Paul Bragg in the early 1900s. His daughter Patricia, runs the business today. Paul Bragg originated and opened the first health food store in California, and pioneered the first health lectures in America. He also opened the first health restaurants and health spas in America. As a teenager, Paul Bragg was crippled by TB. He developed a program for eating, breathing and exercising which resulted in rebuilding his body to be tireless, pain free and super healthy. In return for his renewed health, he made a pledge to God to spend the rest of this life showing others the road to super health. This pioneer has made a difference worldwide in the health of other people. ONE QUARTER OF WHAT YOU EAT KEEPS YOU ALIVE, THE OTHER THREE-QUARTERS KEEPS YOUR DOCTOR ALIVE. As far as a salt substitute goes, Bragg Liquid Aminos is number one. Barbara uses this product whenever she needs to bring out the flavor of food and to avoid using table salt. We have a huge salad almost everyday for lunch and the healthy salad dressing is simple: fresh lemon or lime juice and Braggs. Barbara also adds a very small amount of olive oil on her salad. A Salt Substitute for Just About Everything! We also use this product in stews, vegetable dishes, pastas, stir fries, gravies, rice and beans, on tofu, and just about any dish that requires seasoning. 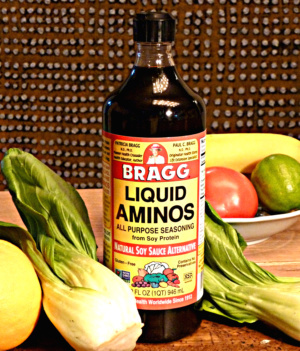 Bragg Liquid Aminos flavor is not as intense as soy sauce. One teaspoon equals 320mg of sodium. It is made with NON-GMO soy beans and is not fermented like tamari and soy sauce. Bragg Liquid Aminos is available in various bottle sizes. For those wanting to limit the amount of sodium consumed, you can dilute it with 1/3 distilled water, or use the small 6 oz. spray bottle. You can find this excellent product in many supermarkets and health food stores, and you can also order it on line. Hope you find it, use it, and enjoy it!